The Finnish Lapphund are an arctic spitz herding breed descendant from the harsh Lapland region of northern Finland, Sweden, Norway and Russia. They were traditionally used as working dogs by Sami farmers in the care of their reindeer herds. An ancient breed that have been used as working dogs by the Sami people for centuries, they are new as a recognised breed in the dog world, the first breed standard being written in 1945 and only being known by their current name since 1993. They are particularly new to Australia, with the first arriving in 1995. They are a strikingly beautiful breed, of medium size, with a full coat which comes in a rainbow of colours, the most common being black with tan and/or white markings. Gentle and intelligent, there is also something quite ancient and magical about them, and all who meet them should expect to be bewitched. ​Arctic spitz type dogs of the Finnish Lapphund type have been companions and working dogs of the Sami people in the region of Lapland across the north of Finland, Sweden and Norway for hundreds of years, with archeological digs finding skeletal remains of Lapponian Dogs dated from approx 7000 BC. However they were only recognized as a breed from 1967. 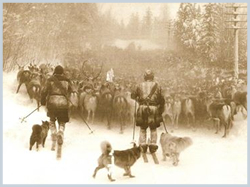 It is thought that as the Sami culture evolved from nomadic hunter/gathers who followed and hunted the reindeer herds for food and clothing, to communities which farmed those same reindeer, the functionality of their working dogs evolved also from hunters to herders. That history remains in the instinct of the Finnish Lapphund today, with many having strong hunting/searching/tracking skills. 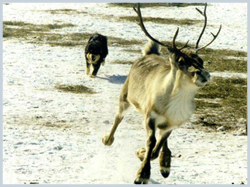 Originally there was only one type of reindeer dog, however these had little uniformity in outward appearance, with working ability being far more important. Hence there was a range of coat types and colours – with colours tending to be divided by region. Over time, two general types of dogs appeared: (1) a dog with a shorter coat and longer body who could trot across long distances and was used for the moving of herds, (2) a shorter bodied, longer coated breed which moved with the tail over its back, more suited for short, fast bursts of work, who tended to live at home with the women and children and be used for guarding and herding the reindeer left at home. Invasions during World War II, and a distemper epidemic in Finland following the war almost totally wiped out all of these reindeer herding dogs. Several attempt to protect the breed commenced. The Swedish had started these moves far earlier, selecting only solid black and solid dark brown dogs to develop the Swedish Lapphund. While it is true that the Finnish and Swedish Lapphunds both descend from the reindeer herders of the Sami people, they have been bred separately as distinct breeds with a number of differences between them. One of the earlier attempts to protect the breed involved a man-made creation believed to have included blood lines of the Karelian Bear Dogs crossed with the reindeer herders. This type, the Kukonharjulainen, bore a strong resemblance to a Belgian Shepherd, but was a largely unsuccessful program, unused in many of the breeding programs. In the 1950s the merging of the different Kennel Clubs in Finland into the Finnish Kennel Association, started the development of a lapponian herding breed. 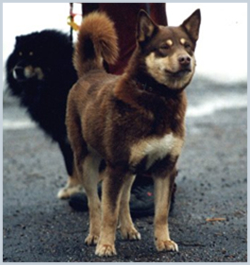 Over time, the differences between the shorter coat herder and the longer coat herder became recognized and a review was conducted in 1967 to separate these into the two breeds – the Lapponian Herder (Lapinporokoira) and the Lapphund (Lapinkoira). Around about the same time, the Lapphund type started to lose favour with the Sami farmers with the shorter coated Herder being found more suitable for their changes in herding practices and a widespread use of skidoos. Two early kennels, Peski and Poromiehen are credited with much of the work in the 1970s to establish the breed, purchasing a number of these longer coated dogs from the Sami people to further their breeding programs. There were further revisions to the standards of these two breeds in 1975, and then in 1993 when the breed name changed to Finnish Lapphund (Suomenlapinkoira). These revisions have further recognized the differences between the two breeds, which extend to body type and head shape as well as coat type. There are no Lapponian Herders in Australia, and the breed is not yet recognised here. One group of enthusiasts have been critical of a perceived increase in “showiness” or generic “spitziness” in type of the Finnish Lapphund breed, and have made some attempts to keep the Lapphund as a trotting breed along similar shape to the Herders. 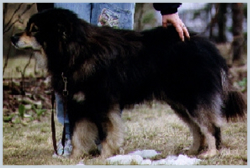 These Finnish Lapphunds (Paimensukuinen Lapinkoira) came from selective breeding of 29 stem dogs, and while less uniform in type tend to be longer bodied with increased angulation, and sometimes less of a full coat. There have been attempts to have these classified as a separate breed, but these attempts have been unsuccessful to date, and many of this line are used for out-crossing purposes within the “show lines”. 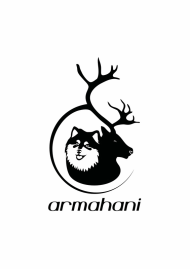 Both the Finnish Lapphund and the Lapponian Breeder breed registers are still open, allowing for unregistered “natural” dogs direct from Lapland to go through an evaluation process to become registered. The incidence of this happening for the Finnish Lapphund breed has now reduced considerably but there are still occasional cases.